Hidden along the central California coast is a unique restoration and preservation facility where cars bearing the three-pointed star are a singular focus, especially 300SL Gullwings and Roadsters. In the USA, there are several well known and high profile restoration specialists that have made their name focusing on the Mercedes-Benz margue, particularly the 300SL Gullwing and Roaster. Best known is the factory owned Mercedes-Benz Classic Center in Irvine, California. On the East Coast, Paul Russell and Company has turned out many concours winning Mercedes-Benz classics. On the West Coast, specifically just north of the US border in Victoria, British Columbia, you’ll find Rudi and Company. Led by Rudi Koniczek, Rudi & Company has restored and preserved a number of significant three-pointed star classics. In California, besides the Mercedes-Benz Classic Center, there are two independent marque specialists. First is Hjeltness Restoration in Escondido which restored the on-off Pininfarina Coupe we profiled in Mercedes Enthusiast October 2015. And then there’s the subject of this feature, Scott Grundfor Company in San Luis Obispo, California. We first had the opportunity to meet Scott Grundfor in the summer of 2014 when he displayed a one-off 1955 Ghia Gilda concept prototype for the Rodeo Drive Concours d’Elegance in Beverly Hills where the theme was Jet Age classics of the mid-century era. In period, the Gilda was a non runner, but there as the intent 60 years ago for it to be turbine powered. After acquiring it in 2005, Grundfor made it a runner with the installation of a lightweight, single-stage AiResearch unit. Visiting Scott’s facility involved a trip up to California’s beautiful Central Coast just outside of San Luis Obispo. But Scott’s roots go back to the 1970’s when he owned his first, much larger restoration facility in Los Angeles with dozens of employees. From the very start Scott’s restoration efforts set very high standards, with many significant cars in his portfolio. These include cars for the Los Angeles Museum of Contemporary Art, the Los Angeles County Museum of Natural History, the 2008 Dream Exhibition in Turin, Italy where the Ghia Gilda (named for screen siren Rita Hayworth, once the wife of the Aga Khan and who stared in the 1946 film noir classic, Gilda), the 2009 Concorso d’Eleganza Villa d’Este in Italy and many appearance at Pebble Beach Concours d’Elegance where Scott has served as a judge since 1989. So much for Scott’s history, let’s focus on his current involvement in the classic Mercedes-Benz movement. Here, Scott and Scott Grundfor Company sit at the intersection of competing and compelling interests; restoration versus preservation. Most of us have heard the saying. “It’s original only once” and over the last 10 years there’s been a visible and sustained movement towards preservation and away from traditional nut-and-bolt restorations. After giving Mercedes Enthusiast a tour of his facility, which includes many OEM concept cars from the 1980s and1990s in his own collection, Scott offered these observations from behind the desk in his office/research library. “When I started in this business in the early 1970s the emphasis was on restoration. Original cars were considered mostly as good candidates for restoration. The better the original condition, the less the expense to bring the car to show condition. “I, however, and many others in the restoration profession, have always found the unrestored vehicle to be the most interesting. Unfortunately, until recently, this has been a category that was largely ignored by the market. And, as we all know, the market establishes what is done, as well as what is and what is not collectable. 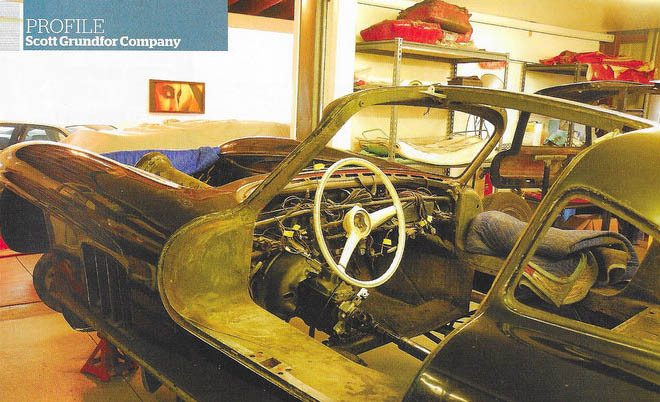 “Beginning about 15 years ago, the idea of there being value and hence interest in unrestored vehicles seemed to take a foothold among some collectors and enthusiasts,” Scott continued. “The advent of ‘Preservation’ classes at Pebble Beach and other concours events has reinforced this thought and created a growing interest in original, unrestored vehicles. Recently, the value of some of these cars has eclipsed that of the same model in restored condition. Virtually any vehicle can be restored – more than once – but it can be original only once. And with the current infatuation with so-called ‘barn-finds’, Scott offered these observations. “It is worthwhile to differentiate the barn find from the true preservation vehicle. The barn find is typically a car that is largely unrestored but has not been well cared for. Unlike during his days in LA, with its huge facility and many employees, Scott now lords over a smaller, much more focused operation. Key members of the team include Service Manager Mike Inase, Shop Foreman Nate Garcia and the general restoration crew members that include Angel Dela Cruz, Jerrad Douglas, Rian Mabus and Victor Burgos, Scott says he would be remiss if he didn’t mention his indispensable office manager, Diane Deering. In addition to its restoration and preservation efforts, Scott often acts as a consultant to enthusiasts wanting to acquire or sell a classic Mercedes-Benz, and is known worldwide as one of the foremost authorities on the marque and specifically the 300SL Gullwings and Roadsters. It’s not uncommon to see Scott Grundfor mentioned as a car’s restorer in auction listings from Gooding, Bonhams and RM Sotheby’s. Such a mention can easily add 10 to 20 percent to the price realized by the seller, such is Scott’s reputation in the classic Mercedes-Benz community worldwide. And what’s noteworthy about Scott is his willingness to share his expertise and passion for restoration and preservation with others via www.scottgrundfor.com. On his website you will find sections where you can learn many of the secrets that Scott and his company have developed and honed over the past four decades. These include restoration and preservation techniques that you can apply on a do-it-yourself basis to your own Mercedes-Benz. And over the years, having bought and sold many Mercedes-Benzes, and not only 300SL Gullwings and Roadster versions, Scott has assembled a vast database, complete with high resolution photographs, that shows exactly what constitutes a Pebble Beach level restoration, or – as it has become so much a part of the classic car scene – a top tier preservation effort. Again, this huge resource is available free of charge on Scott’s extensive website. It certainly was a treat for Mercedes Enthusiast to visit Scott’s facility. It’s a bit off the beaten path but well worth the visit if you are holidaying in California. Be sure to call ahead to make an appointment, as things get quite busy for Scott and his team, especially on the eve of a major event like Villa d’Este or Pebble Beach. But at other times, when things are not so hectic, you’ll find Scott more than willing to share his passion and enthusiasm for classic cars. It might sound clichéd, but it’s in his DNA.